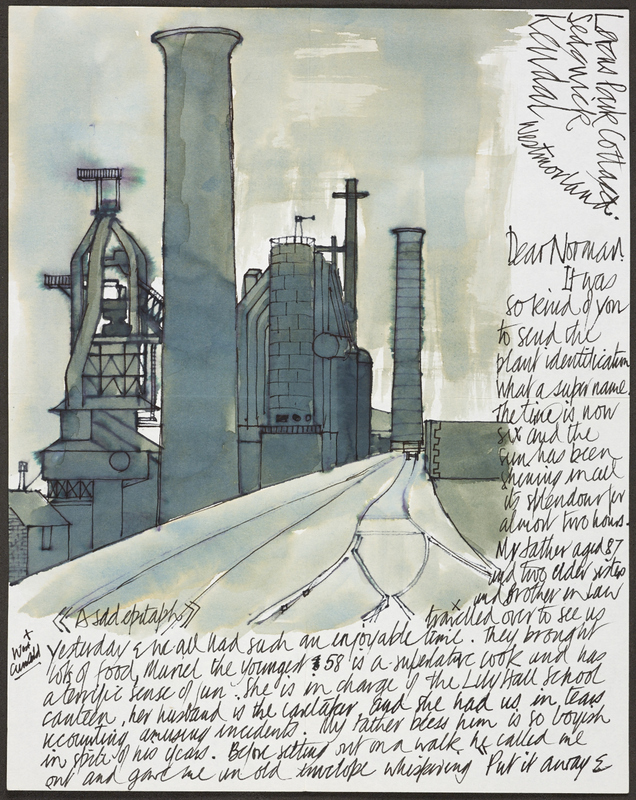 Painting by Kelly of a blast furnace at Millom, labelled ‘A sad epitaph’, from a letter of 1971. The ironworks at Millom were closed down in 1968. Norman Nicholson’s poem ‘On the Closing of Millom Ironworks’ reflects on this and the widespread unemployment it caused in the town. Last year we celebrated the centenary of Cumbrian poet Norman Nicholson (1914-1987), and the year finished on a high note with the receipt of an exciting new addition to our Nicholson collections. This takes the form of 16 letters sent to Nicholson by the artist Percy Kelly (1918-1993). The content of these is interesting in its own right – Kelly discusses his own work, that of Nicholson and the connections between them – but what makes the letters extra special is that most of them are beautifully illustrated with original artwork. Percy Kelly was born in Workington, West Cumbria, and like Nicholson he took inspiration from the industrial landscape of the area. Although he was talented at drawing from a young age, financial circumstances prevented him from attending art college; instead he left school at 14 and worked for many years for the Post Office, finally attending college when he was in his forties. He was prolifically creative, and his talent was recognized by many. However, he could be difficult to deal with and led a reclusive existence; he was reluctant to part with many of his paintings, and very little of his work was exhibited during his lifetime – although this situation has changed since his death, with his work being championed by Chris Wadsworth, founder of Castlegate House Gallery in Cockermouth. 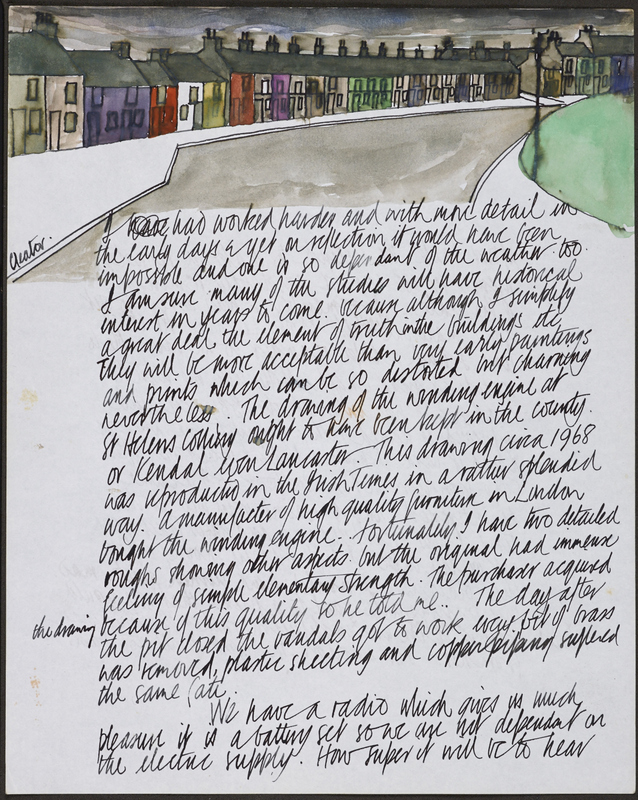 This letter from Kelly dated 15 December 1973 includes a painting of Trumpet Terrace, Cleator Moor (Nicholson wrote a poem called ‘Cleator Moor’ which appeared in his first collection, Five Rivers, in 1944). 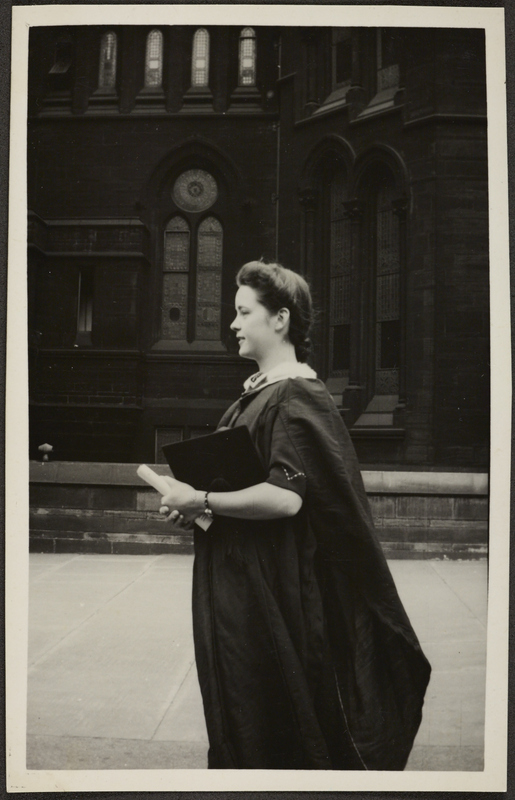 Kelly and Nicholson first met in 1955, through Allen Freer (an educator, artist and collector, whose papers are also held at the Rylands). They probably corresponded from this point on, but the earliest surviving letter from Kelly to Nicholson that we know of dates from 1971. Unfortunately none of Nicholson’s letters to Kelly survive – archival correspondence is often tantalisingly one-sided like this – but it is fortuitous that these letters to Nicholson have been so carefully preserved. 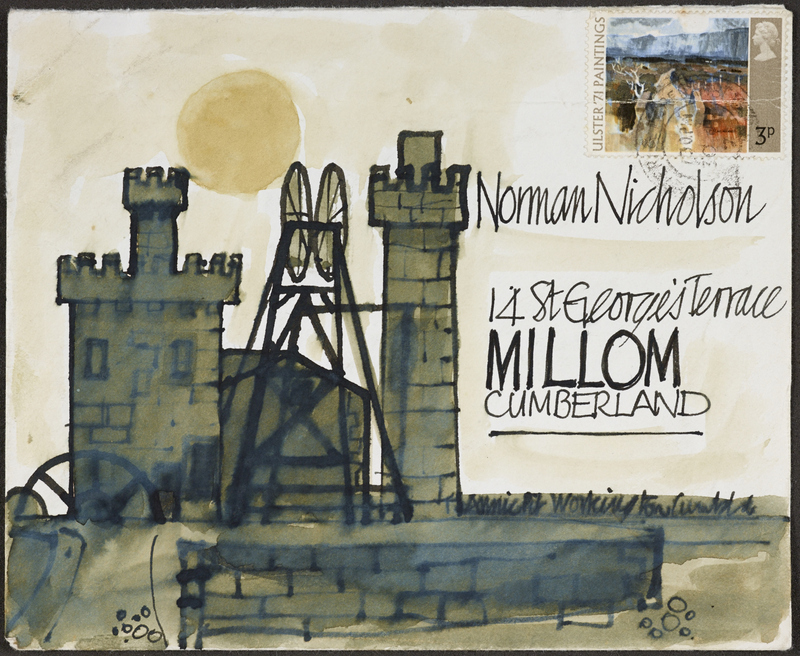 They must have been a delight to receive: many of the letters (and often the envelopes too) are illustrated in watercolour or pen and ink with scenes of machinery, pitheads, railways, boats and harbours, mining villages, and isolated farmhouses glimpsed across Cumbrian fells. 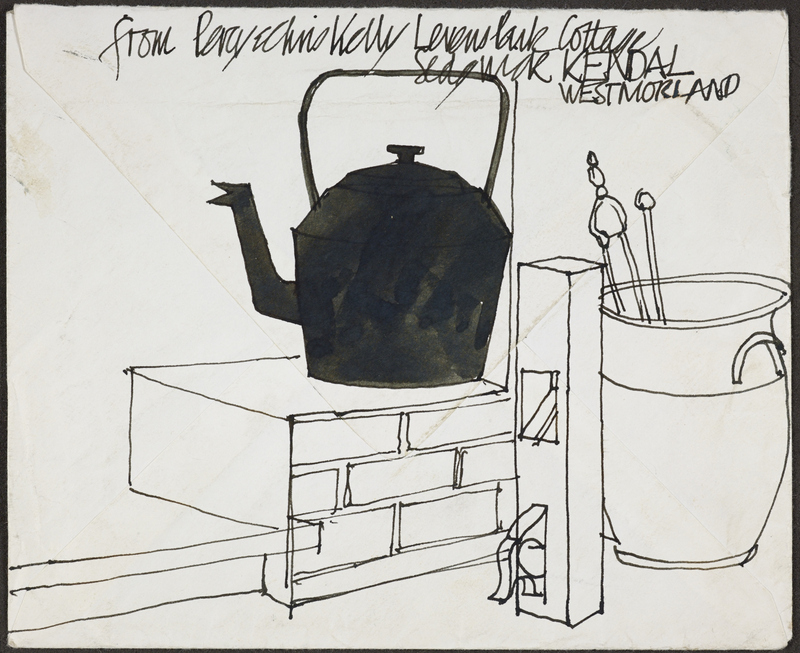 Although Kelly left Cumbria in 1973 for Pembrokeshire and subsequently Norfolk, he continued to be inspired by his native region; in one of the letters he comments how ‘I miss the industrial pattern of Cumberland’. The reverse of the same envelope. These letters were acquired in 1999 by Joan David, a great friend and correspondent of Percy Kelly during the last ten years of his life – and another lucky recipient of many illustrated letters. We are extremely grateful to Joan’s son and daughter who have deposited these letters at the Library in memory of their mother, an alumnus of the University of Manchester. If you are interested in finding out more about Percy Kelly and his work, there is an informative website devoted to him, and a biography by Chris Wadsworth: The Man Who Couldn’t Stop Drawing (2011). An edited selection of Percy Kelly’s letters to Norman Nicholson by David A. Cross (Cumbrian Brothers) was published in 2007. We are grateful to Chris Wadsworth for granting permission to reproduce Percy Kelly’s artwork here. But where are all the people? There’s sadness here, but what wonderful stamp designs could be made from Kelly’s work which merits such wide dissemination. Really enjoyed this too! Thanks for sharing.